10 Pre-Code Horror and Scare-Fi comic book stories from 1952,1953 and 1954 all hosted by Sam Scare with a special introduction by Sam. 64 page magazine-sized book, only 125 printed. CLICK IMAGE FOR DETAILS. Vampires, werewolves, and even a Mr. Hyde (looking like Frederick March from the 1932 movie!). Loads of pre-code black and white monster comics. Dip into the graveyard, ghoul, with your host Sam Scare! Goofy ghouls, atomic monsters, werewolves and more. Lots of pre-code comic reprints hosted by Sam Scare! Retro horror fun. 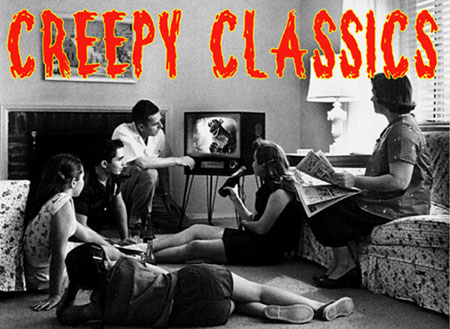 Sam Scare has cleared the webs in his archives and dug up some great pre-code scares from 1950, 1951, 1952, 1953 and even 1948. It's another 64 page collection presented in black and white and magazine size in our limited edition (only 125 copies) magazine/book format. Classic pre-code comics from the 1950s reprinted in all their gory here from Dennis Druktenis and Scary Monsters. Prehistoric Horror Monsters, Were-Spiders and Vampires lurk in the lurch here. Black and white comics in a perfect bound reprint book with color cover.